Well that was a little bit more like it. That headline would also be better if Dan Hinote was somehow involved with the BG hockey program. OK, let’s be real, this weekend was a pretty successful one for BG. All things considered during the past month and a half, it was as good of a way as any to finish out the first half of the season. Getting three out of four points against anyone is a pretty good weekend. It’s even better when it comes against a team that will likely be finishing right next to you in the standings at the end of the season. Alright, you can say that about just about every team in the WCHA at this point, but I digress. 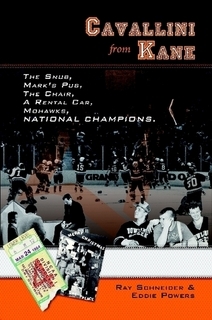 Entering the year, Michigan Tech was picked to finish third in the league by the coaches. They’ve had a rather skittish first half, but at the moment the Huskies find themselves only two points behind both BG and Bemidji, and they have two games in hand. So yes, getting three out of four points against Tech is a strong accomplishment, especially when you consider BG has only picked up five points in its past four series’. But it’s not just getting the three points, it’s how the Falcons did it. Did anyone else have terrible third period flashbacks Friday night when Tech scored with just over two minutes left to make it a one-goal game? I did. But BG was able to hold serve and close out the game. How about Saturday? Down two goals mid-way through the third, get a goal to half the score, then go down by two again 48 seconds later? And then score two in the last two and a half minutes to force overtime? That’s as good of a tie as you’re going to get. It’s certainly a lot better than tying when you were the team that was up by two with two and a half minutes left. And that’s speaking from personal experience. At this point, it’s hard to say the Falcons are playing “well,” but 2-1-1 the past four games is a lot better than the 2-5-1 of the previous eight games. Now BG gets some time to recharge the batteries before playing a two-game set in Pittsburgh for the Three Rivers Classic. At this point, the games mean nothing other than giving BG a chance to stay sharp during the holiday hiatus and maybe try some new things with lineups. The time off will also allow players to get healthy, namely Adam Berkle, who once again missed both games this weekend. It also means the next time BG takes the ice in a WCHA game, it could be doing so with Ryan Carpenter on the ice, which is a good thing. Duh. A lot happened this weekend and since there won’t be anything to morning observe for a few weeks, you get the long version today. Let’s get into it. Forwards: The whole “Dajon at defense” experiment lasted all of three games and it was really confusing to me, because on Friday coach Chris Bergeron was dressing six other defensemen, so it sort of felt like a moot point. That also could be why Mingo was back at forward Saturday. I don’t know, I guess it was fun while it lasted. As we’ve been over before, I can’t watch the games, so I can’t fairly say how Mingo looked at defense, but he seemed to enjoy it, potting three assists in three games. But then he had a goal and an assist back at forward Saturday, so there’s that too. You also kind of have to factor in that in road games, BG only brings two or three reserves with them, so scratching Ted Pletsch for game two could’ve played into that decision as well. After all, Bergeron still dressed seven defensemen for that game as well. Whatever Bergeron’s motivations were for moving him back, if Mingo can excel in the defensive end like the did offensively in his three-game tryout, it won’t be the worst idea to move him back there once Carpenter and Berkle are back in the lineup. It sort of turns into a whole economics discussion of where does he present the most value to the team. It kind of also depends how the other guys are doing, too. BG has had good offensive balance at forward this season, with nine forwards (including Mingo) posting at least eight points so far. However, among defensemen, only Ralfs Freibergs has more than four. It would be nice to have a second offensive defenseman to add another dimension to BG’s attack. At the same time, it doesn’t make sense to keep Mingo back there if he’s not defensively responsible because that’s how you give up a lot of goals. What do I think happens? I’d say he stays at forward. I think that’s where he has the most value to the team, and keeping him at forward gives BG an offensive depth that not too many teams in the conference can match. Just think about it, as of right now, BG has three full lines of forwards with at least eight points on the season. There’s a couple of teams with seven, and Ferris has eight. That number for BG also doesn’t include Carpenter, freshman Matt Pohlkamp or Cam Wojtala, who both have seven. Burke: For the first time this season, Bergeron broke up the goalie duo and started Tommy Burke both games. I think it was a little bit of both giving Tomas Sholl some time to mentally take a break and a way to shake things up. On the season, Sholl still sports a respectable 2.65 goals-against average, but he’s given up four goals in three of his last four starts, and he gave up three in one game he didn’t give up four. He also has a 2-7-0 record on the season, which is more so an indictment of the entire team than just him, but BG had lost five straight Saturday games, so mixing things up really couldn’t have done any harm. Even though he gave up four goals in Saturday’s game, Tommy Burke played perhaps his best weekend as a Falcon. Friday, he stopped 39 of 41 shots. That was a career high for all of one night. He stopped 43 of 47 Saturday and is a big reason for why BG was able to pull off a tie. What does this mean for the goalie split? Probably nothing. It’s easy to forget that Sholl is still a true freshman — and at 19-years-old, a young one by college hockey standards. Giving him a breather at this point in the season, conveniently right before the team has a two-week break, is not a bad idea. I would not be the least bit surprised to see him back in net for game two of the Three Rivers Classic in a few weeks. BC: Speaking of which — yeah, how about that transition? At said Three Rivers Classic, BG will take on Boston College and former coach Jerry York. York, you may remember, is the man who led BG to its National Championship in 1984 and is the winningest coach in college hockey history, surpassing another former BG coach in Ron Mason last December. The game really doesn’t have any implications for BG. The Falcons are not qualifying for the NCAA Tournament as an at-large team and are a pretty far ways from being ranked, but it’ll still be a great game to watch. BC may not be the best team BG faces this year (that honor currently goes to Ferris, now up to No. 2 in the nation) but the Eagles will be the most talented team. The one guy you’ll want to watch is Johnny Gaudreau. He dominated for Team USA at the World Junior Championship last year, and was a finalist for the Hobey Baker Award with 51 points in 35 games. He has 28 points in 16 games this season. It doesn’t just stop there. The Eagles have multiple first and second round NHL Draft picks on their roster. Freshman goalie Thatcher Demko, who’s only played six games but has a 4-1-1 record, is one of the top draft-eligible goalies for 2014 (although he will be in Sweden for this year’s World Junior Championship so that was kind of a moot point). The bottom line is there’s a ton of talent on Boston College, perhaps more than any team BG has faced the last few seasons. Yes, I’m not forgetting about the Notre Dame and Michigan teams played in past seasons. Second half: BG finished the first half of the season at 8-8-4, which is the best first half of the season BG has had in like a billion years. OK not really. It’s the best first half of the season for BG since the 2007-08 campaign, when BG went 8-8-0 prior to the turn of the calendars. That should bode well for the Falcons moving forward. Not only is the second half schedule incredible manageable (no second matchup against Ferris State, no Mankato, get both Lake Superior and Bemidji at home and only three road weekends), but BG has been a much better team in the second half the past two seasons. Including the postseason, in 2011-12, BG went 6-13-3 in the 2011 portion of the schedule, and 8-12-2 in 2012. That’s not a huge improvement, but it’s enough of one to allow me to make my point. Last season, also including the playoffs, BG went 11-11-1 2013, after going 4-10-4 in 2012. That 11-11-1 mark includes the 1-4-0 turd BG dropped to close out the regular season. Things are aligned for BG to make a similar run this year. Not only is the schedule manageable, but also Carpenter should be back, if not for the Huntsville series the first weekend of January, sometime during the first month of 2014. Adding a guy who was named one of the three best forwards in the conference at the beginning of the season is obviously a huge plus. Until then, enjoy your holiday season. After another hiatus last week, power rankings will be back this week for the final time in 2013. What better way to kick off your winter break (for students … if you’re a professional anything but a teacher and have a winter break I totally want your job) than by reading some hockey humor? Maybe the Huntsville people will get mad at me again.